It's that time again. School supplies are flying off the shelves. Teachers are losing sleep over their bulletin boards and to do lists. Children are dreading the end of summer. It's back to school time! Here in Michigan, we still have another month before schools are in session but schools all over the country are back in session right now. If you are in the market for some back to school products, I have a few items that are new or newly updated including a FREEBIE!!!! Another game in my bingo series, this comes with 30 different boards to use for back to school bingo. It comes in color or black and white. It is an easy time filler during those first few weeks. Just print, add bingo chips and you are good to go. I would usually pull out math manipulatives for my students to use as bingo chips. The boards have school supplies and a label underneath each picture, which makes it perfect for working on vocabulary as well. I recently updated this product and gave it a major facelift. I added new clipart, new anchor charts and a new craftivity. My classroom rules were Be Safe, Be Kind, Be Your Best. I read a picture book for each rule and did an activity related to the rule. Each day during the first week of school, I focused on a different rule. This product includes lesson ideas, activities, printable anchor charts in color and black and white, and directions and templates for a bee craftivity to review all three rules. If you are looking for new and simple classroom rules and activities to go with them, this product is for you. For this product, I combined three smaller back to school activities that I liked to have on hand during the first few weeks of school. You know those first few days where you can't get the timing just right? You plan something and it takes them FOREVER to finish. Or you plan an activity thinking it will take them hours and they finish it quicker and you are scrambling for what to do because you don't have all of your procedures in place for what to do with fast finishers. 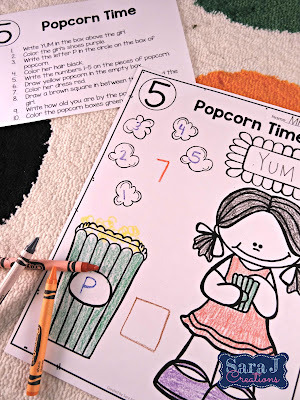 This is when these activities came in handy, especially the following directions activities. For the following directions activity, you get 10 different pictures. Pick one, print it off for all of your students along with one copy of the directions for you. You read the directions orally one at a time. Students need to listen carefully and follow the directions as it relates to the picture. Most of the directions involve coloring, circling, x-ing, drawing simple shapes or pictures and writing words. I tried to make the directions that were atypical such as coloring a person blue so that students had to really listen and not just color what they think it should look like. Also included, is Who Am I? I liked to do this activity within the first few days and have my students hang them on their lockers. It made for nice decorations in the hallway during open house/curriculum night. 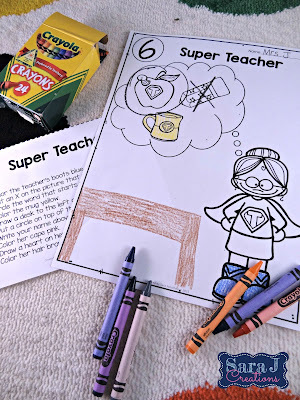 In this activity, students write/draw/cut out their favorites based on the prompts. 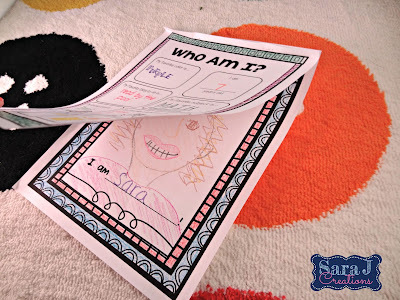 On the second page they draw themselves. They put their favorites on top of their picture so other students (and parents) can use it as a guessing game. They read the favorites, guess who it is, and then lift the flap to see if they are right. 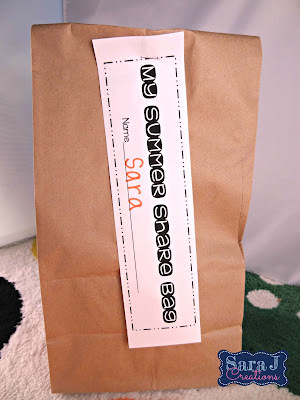 The last activity included is Summer Share Bags. For this, students bring in one thing that represents something about their summer. They show their object to the class and tell them about that summer memory. Students need to make sure they are listening carefully because the final culmination activity once everyone has shared is class bingo where you list things the students shared about their summers. It is a good get to know you activity that works on speaking and listening. I updated my solving problems freebie by adding a few new pages. 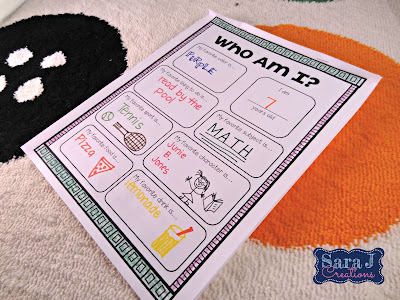 This is another activity that I liked to use during the first two weeks of school. I spent a lot of time explicitly teaching my students how to solve social problems that come up in the school environment. 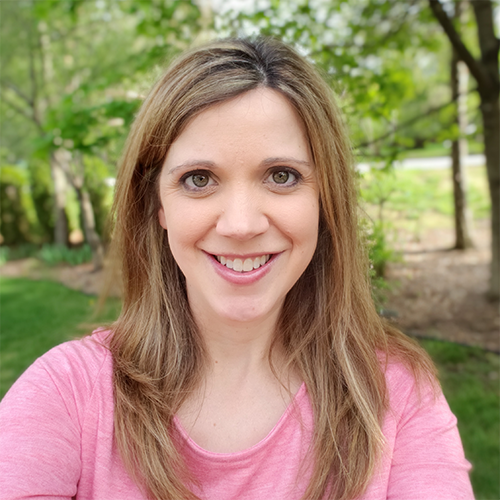 Once I knew that the students had been taught different strategies for solving problems, I could hold them accountable for solving problems appropriately throughout the year and send them back to try other strategies before getting me involved. In this freebie, I've included lesson ideas, problem solving scenarios, problem solving scenarios in journal format, checklist for students, and an anchor chart with ways to solve problems. These are a few of the activities that I liked to do for back to school. What are some of your favorite activities during the first few weeks?